Retail stores and restaurants are severely challenged with the prevention and deterrence of a violent act. Each year in the U.S., there are greater than 50,000 robberies which occur in cash businesses. There are factors which make the odds of being victimized escalate, for example, being open late at night, pharmacies, cell phone outlets, jewelry, and pawn stores. Much of the security industry attempts to build a better zone of protection around these locations by placing cameras and other technologies in areas to draw the attention of criminals, but none of these strategies will thwart a masked gunman. The security surveillance systems become a manner to investigate, all done forensically, after a violent crime has occurred. Drawing on deep roots from law enforcement, the founders of Blue Line Technology, using facial recognition technology in a unique way, have been able to prevent incidents from happening. The technology creates a substantial deterrent to offenders. 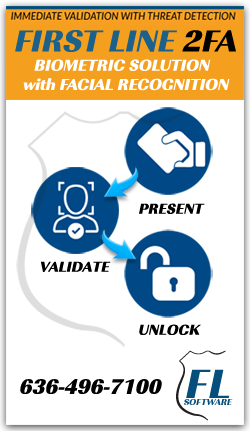 The system is deployed with a maglock and simply requires customers to glance at the deployed Axis camera for immediate entry. Blue Line’s “First Line” software is a leader in the industry, and part of that success is speed and the instant ability to “alert” – doors can be actuated in a fraction of a second. Another unique Blue Line factor is the three categories the client may use. The “red” or alert portion can be used to exclude a known thief, a persistent nuisance violator, or a potential workplace violence threat. The green category can be used to welcome a good customer you haven’t seen in a long time, but the system remembers by name, with notes of their value as your customer should the person opt in to the good customer program. The last category, and very unique to Blue Line, is the “unknown” face capture. This allows for facial recognition to exclude anyone hiding their face, in particular, a masked and armed gunman. The latest FBI statistics indicate that about 86% of robbery suspects in these locations have some style of mask or bandana hiding their face. Most importantly this process of requiring a glance at the camera, creates a substantial deterrence to most criminals. Whether they are casing a location for a later robbery, going to commit a fraudulent act, or have the intention to shoplift, Blue Line’s facial recognition with our badged logo gives the strong impression that the store is working with law enforcement and security providers at the location committed to preventing a crime.